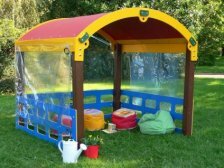 A beautiful, brightly coloured, Children's Play Den with fully covered roof, and holes for fixing various types of plastic or cloth side curtains to keep out the wind (curtains not included). A very solid build made from recycled and recyclable plastic. Nickel plated fixings which do not rust and nothing in the den can rot. Maintenance free. Can be left out in all weathers. 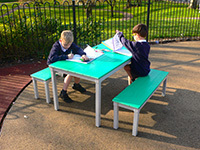 UV protected colours to reduce fading in direct sunlight. 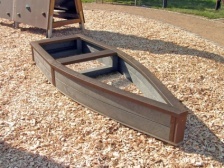 A simple robust adventure ship to stimulate creative role play. Add sand to use as a sand box or soil for a raised bed. 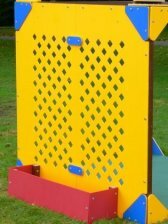 Made from heavy duty recycled plastic this is a piece of outdoor play furniture that will never rot, and no splinters for little fingers. 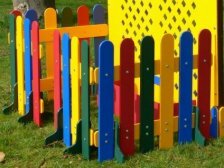 Perfect for nurseries and kindergartens. No maintenance needed. Our designers love creating new play dens with optional add-ons that can change a theatre play den into a shop, or a simple cosy den. New modules are being considered every day. If you have an idea for one, please let us know and we will see what we can do. 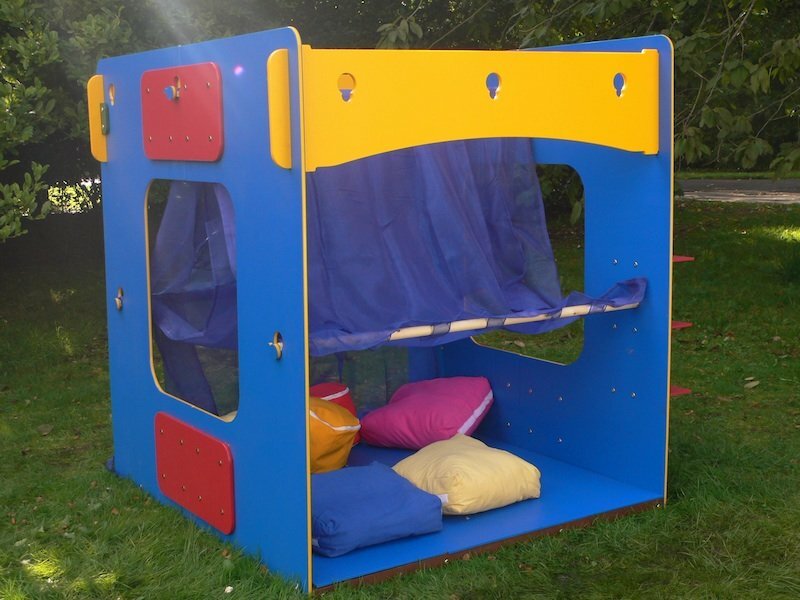 All our play dens are made from up to 80% recycled plastic which keeps a lot of plastic milk bottle cartons out of landfill sites and incinerators. 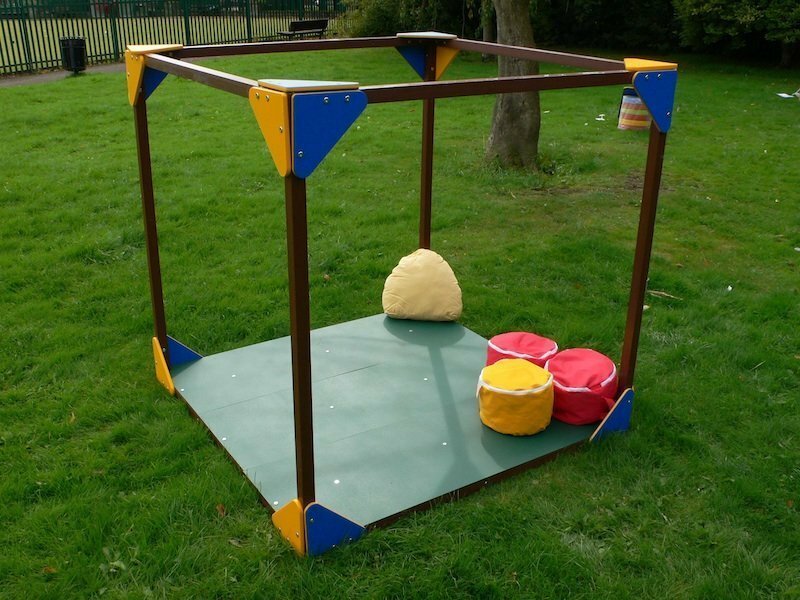 So if you happen to be shooting for an eco schools award, these are the play dens for you. 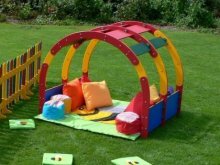 Apart from the eco-friendly value, these play dens are robust and built to last for decades sitting outside in all weathers. They are easily cleaned with normal household cleaners and are non absorbent and hygeinic. Graffiti wipes off with water and detergent or WD40, and the colours have the highest rated UV protection against fading in direct sunlight. As a child we all loved little dens to play in, indulge our creativity, or sit around in reading. 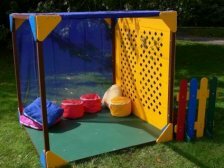 No school or nursery should be without one or more of these fun, brightly coloured outdoor Play Dens for role play, reading groups or creative play. To order just add to the basket, or give us a call on 01282 861325, e-mail or fill out the online enquiry form for a quick response.